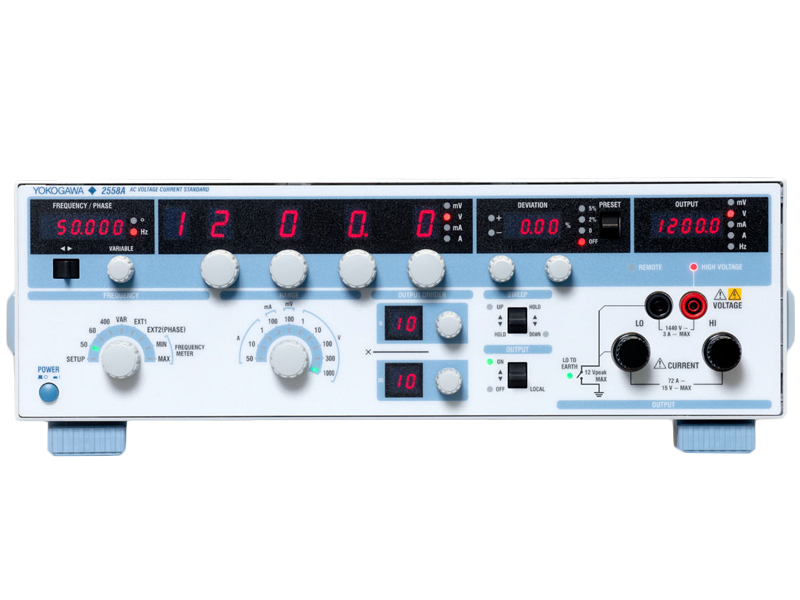 The 2558A is a cost-effective, high-precision instrument capable of outputting a wide range of AC voltages and currents for the calibration of AC measurement devices such as analog wattmeters, power meters, clamp-on testers, and current transformers. Intuitive front panel controls and various computer interfaces enable the 2558A to be operated manually or become integrated into an larger system. 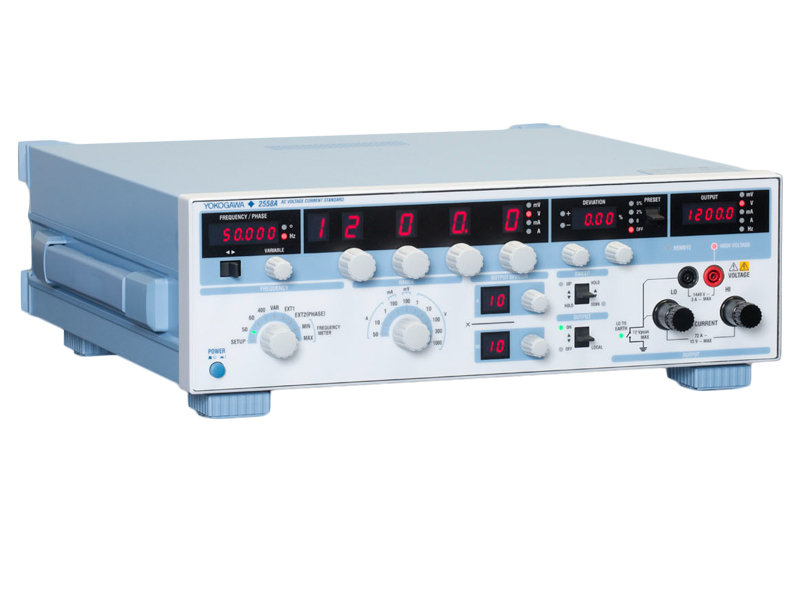 The 2558A AC Voltage Current Standard offers users the best-in-class functionality and reliability customers have come to trust from Yokogawa. The wide output ranges of 1.00 mV to 1200.0 V AC and 1.00 mA to 60.00 A AC mean that the 2558A is the instrument of choice for the cost effective calibration of AC analog meters. Rotary controls and a range of computer interfaces enable the 2558A to be intuitively operated through the frontpanel or controlled by an ATE system. The 2558A AC Voltage Current Standard is more than sufficient to calibrate meters with a class 0.1 % accuracy. * Add 0.1% of range when output is 120% to 144%. 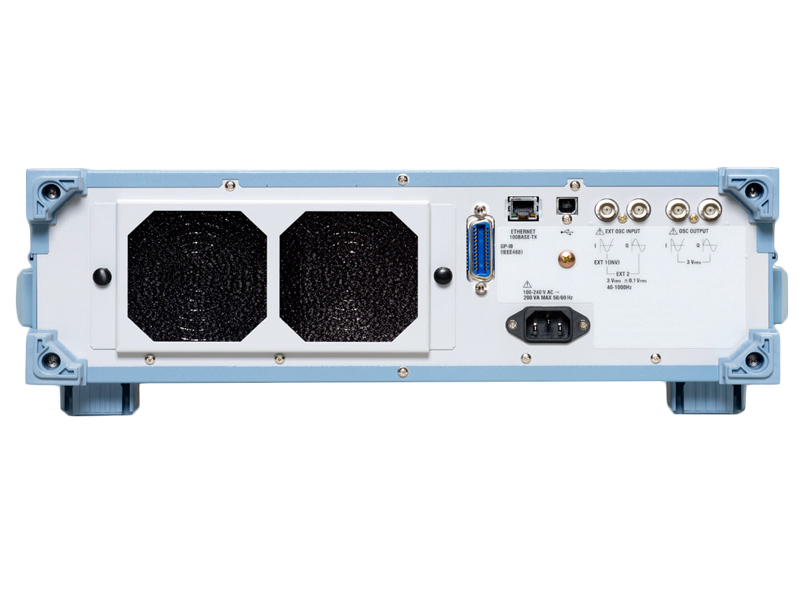 The 2558A provides fixed frequencies of 50/60 Hz (commercial) and 400 Hz (marine and aviation), as well as variable frequencies from 40 to 1000 Hz. The high frequency accuracy of the 2558A (50 ppm) also enables it to be used to calibrate frequency meters. 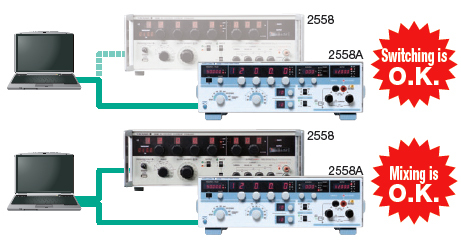 Multiple 2558A units can be synchronized using the internal phase shifter. This means that two 2558As can be used as accurate sources of voltage and current for calibrating power meters. The 2558A provides specific functions to enable meters to be calibrated accurately and efficiently. Calibrating two or more points is quick and simple. It is only necessary to preselect the number of required calibration points with the lower divider control and then use the upper control to step the output to the next calibration point. The deviation settings will then enable the output value and error of each calibration point to be displayed directly. The deviation preset control can be used to move the output value in small increments (2 or 5 % of the step between calibration points). This means that it is possible to finely approach the target calibration point, either from a lower value or a higher one, without exceeding it. This is particularly useful when the friction (hysteresis) of the moving part needs to be taken into consideration. In this case, the point is calibrated twice, once from a lower value and once more from a higher value and the final calibration result is the average of the two. Needle sticking tests can be performed with high repeatability. It is possible to stop at any point and sweep around it in fine detail. A power calibration system can be created by using two 2558As (one each for AC voltage and AC current) together with a Yokogawa WT3000 power analyzer as the reference. One of the 2558As acts as the master unit and provides the synchronizing oscillator signal. 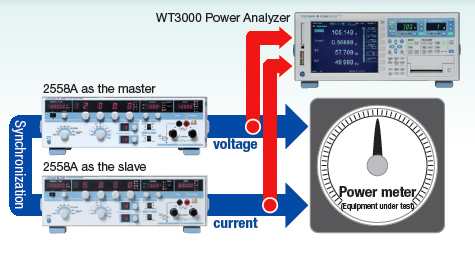 The required power factors is set by adjusting the phase shifter on the slave unit and monitoring the result on the WT3000. A 3 phase power calibrator system can be simply built by adding further 2558As. To generate higher current than 72 A, two 2558As can be connected to double the output to 144 A. Accuracy, stability, temperature coefficient is the sum of the individual units. The 2558A is backwardly compatible with the previous 2558 Model. The new 2558A supports a 2558 command mode, which means that you can switch from the 2558 to the 2558A without modifying your program. It is also possible to mix 2558s and new 2558As in the same system. * 1% to 144% of range when frequency is 50 or 60 Hz. * Add 0.1% of range when output is 120% to 144% of range.